Starting from Bodrum, cruise to Kos and discover the magic of Kos, the island of Hippocrates who was the first medical doctor in the world, the castle of the Knights of the order of Saint John, discover unparalleled beauty and why Cleopatra herself visited Kos and start living the holiday of a life time on the exciting and beautiful island of Kos. Keep on your cruise to Rhodes (Rodi or Rodos in Greek), the beautiful island of roses. Rhodes is famous as the island of sun, sea and sand, the ideal place for vacations. 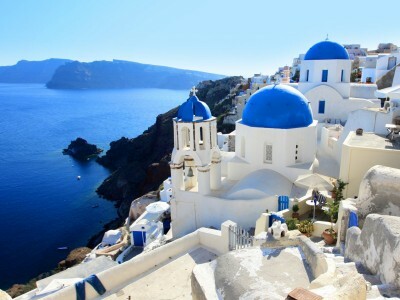 It is the third largest Greek island and, officially, the sunniest place in the Europe. The City is among the finest, not only in Greece but in the whole of the Mediterranean. It is situated at the island’s most northerly point and ringed by sea on the east and west. Rhodes (Rodos in Greek) combines the cosmopolitan character of a contemporary city with the picturesque of the medieval town, which gives the impression of having been untouched by the passage of time to Symi that is a very friendly island with a population of only around 2500. 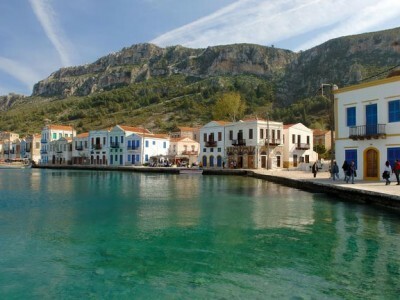 If you have never been to the beautiful and magical island of Symi, we must urge you to consider visiting our island. There are no high rise hotels, no villa complexes, just some small friendly hotels, holiday houses and studios which are traditional Simian houses, some of which were originally wealthy sponge merchant's mansions, renovated with loving care, with modern conveniences which you expect when on holiday. Aboard the yacht, you will be greeted by our friendly and professional crew.. A short briefing from the captain ensures everyone is familiar with the yacht and what we will do during the week to come. 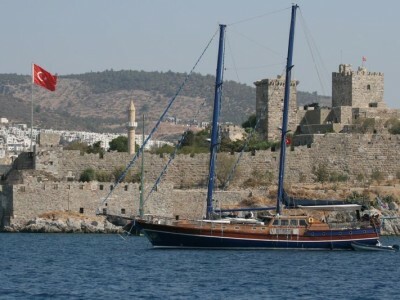 On the first day, our yacht will be anchored at Bodrum Yacht Port for dinner and overnight stay. After breakfast, you will be informed about the cruise itinerary and the boat. After the customs formalities are completed, we will cruise to Kos Island. Asclepion, known to be the birth place of Hippocrates, who is 'the Father of Medical Sciences', is located here. All the people from the eastern Mediterranean with health problems were treated in Kos. Kos is the second largest island of the 12 islands (Dodecanese islands) and has a very mild climate and very fertile lands. The island houses a 560-year-old tree, a 211-year-old fountain and a 290 km long beach. You may take a quick swim in Lambi Beach which is very close to Kos Harbor. Kos is one of the islands with the best night life. Nafklirou, a street full of bars, is always crowded, colorful, and full of life. Our next destination is the charming bay of Nanou in Symi Island where the boat will anchor for lunch and a swimming break. We will anchor at Symi Port late in the afternoon. You can see the shoreline with its neo-classical houses and the peripheral districts. 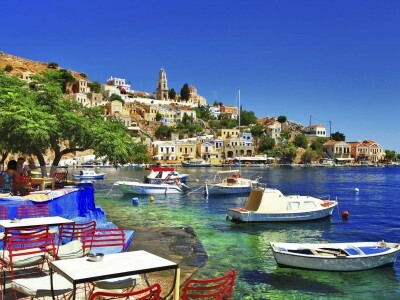 You are going to adore Symi Island for its colourful houses and narrow streets with hundreds of stairs. 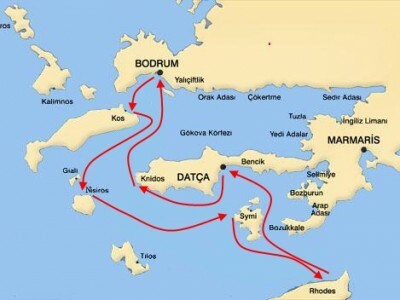 We return to Turkey via Datca customs. While your boat is supplying fresh provisions, you may take a walk in Datca Harbor. After we will cruise to Palamutbuku for lunch, you may also take a walk in the village. Today our final destination will be the world famous ancient city of Knidos. You may visit the open air museum after a swimming break. Cnidus was a developed city in science, art and architecture. Eudoxos, a very popular astronomer and maths professor; Dr. Euryphon; Polygontos, a popular painter; Skopas and Bryaksis of Faros, the most famous sculptors of the era; Sostrates, the architect of Alexandrian light house -one of the seven wonders of the World- and Ktesias the doctor, who saved the life of a Presian king from a disaster, lived on this island. Dr. Euryphon and his students founded the second biggest medical science school in Cnidus. The island also hosts the largest sun clock of its time which was erected by Eudoksos. Knidos was the home for Aphrodite's monument and in those times the city was famous for brothels and became popular for sailors and Arabic tradesmen. You may take a walk on the shore to see the ruins. We will begin to cruise early in the morning to Karaada (Black Island). Breakfast and a swimming break will be at Poyraz Bay which is located on the northern side of the island. This is such a nice bay with its turquoise-blue waters. We will dock in Bodrum Yacht Port for dinner and an overnight stay. * The cruises are on gulet boats with air conditioning.